A spectacular triple bookcase was deeply carved with birds, grapes and acorns in the Renaissance manner in Italy about 1890. The base is rebuilt and has a restored finish, the rest is original, hand carved of solid wormy walnut. Waxed and buffed, all that is needed to maintain the warm patina is an occasional wipe with a soft dry cloth. Joints have carved wooden pegs, sides have raised panels. Shelves are adjustable. 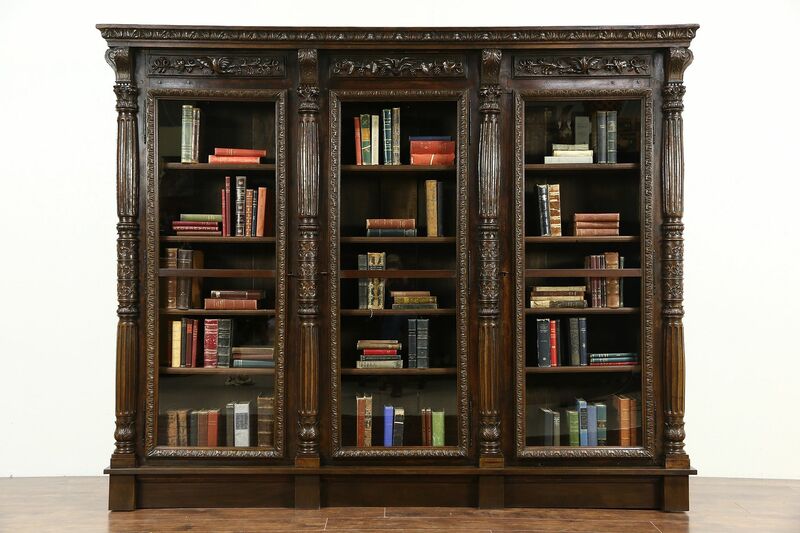 Individual door locks have working keys on this antique library furniture. Dimensions are 97 1/2" wide at the crown, 16" deep and 79" tall.